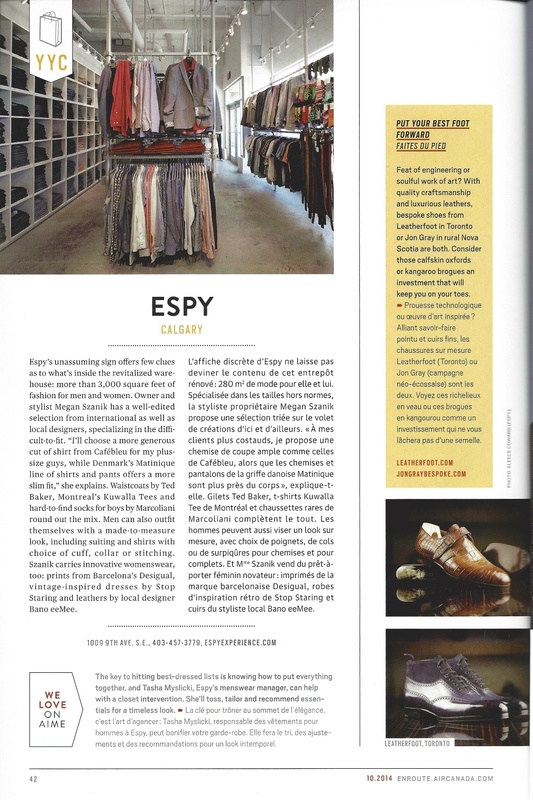 Espy’s unassuming sign offers few clues as to what’s inside the revitalized warehouse: more than 3,000 square feet of fashion for men and women. Owner and stylist Megan Szanik has a well-edited selection from international as well as local designers, specializing in the difficult-to-fit. “I’ll choose a more generous cut of shirt from Cafébleu for my plus-size guys, while Denmark’s Matinique line of shirts and pants offers a more slim fit,” she explains. Waistcoats by Ted Baker, Montreal’s Kuwalla Tees and hard-to-find socks for boys by Marcoliani round out the mix. Men can also outfit themselves with a made-to-measure look, including suiting and shirts with choice of cuff, collar or stitching. Szanik carries innovative womenswear, too: prints from Barcelona’s Desigual, vintage-inspired dresses by Stop Staring and leathers by local designer Bano eeMee. The key to hitting best-dressed lists is knowing how to put everything together, and Tasha Myslicki, Espy’s menswear manager, can help with a closet intervention. She’ll toss, tailor and recommend essentials for a timeless look.